How Can We Cope with the Oil Crisis? Today, modernized and globalized lives relied on the oil, and industrialized economy has been sustained by abundant oil so far. No one can doubt that the current oil price soaring came basically from insufficient oil supply which is called “Peak Oil.” Many experts insist that we be on the plateau of Peak Oil currently. Originally, there isapproximately two trillion barrels of crude oil on earth allegedly, and now we spent almost one trillion barrels of this in spending over 85 million barrels per day, which implies that we, all human beings, would face up to an unprecedented crisis. It can be easily recalled that we have been suffered a kind of hardship by oil shock in 1973 oil embargo and in 1979 Iranian oil shortage, at that time, even though oil supply is deficient just about two percent of its demand for the mean time. However, current oil crisis came from Peak Oil which would impact us more serious situation not only global economy but social security than we have ever experienced before. 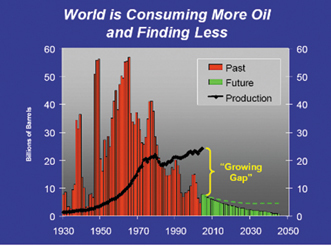 It implies that oil depletion would likely make us go back to the Stone Age in the future. The present prosperous industry and economy in many countries are achieved by using oil. The industrialization of many developed countries like USA and Europe completed with oil, since first crude oil was produced by Edwin Drake in Pennsylvania in 1865. After that, developed countries rushed to make globalization, which stimulated China and India to put spurs to develop their countries with fast growing of their economy as well as industrialization. As a result of it, at present China and India are the huge suckingup countries of oil and energy on the planet. However, China and India also have a role of the world factories, which means that two countries consume tremendous amount of oil as well as emit large amount of green house gases like carbon dioxide on behalf of developed countries. As it is, almost of all the stuffs being used by Americans are come from China. In other words, it is inevitable that most developed countries have to spend huge fossil fuel and emit green house gases, unless China and India produce all kinds of stuffs people need. Obviously, the majority of experts seem to agree that we are passing the peak of oil usage currently. 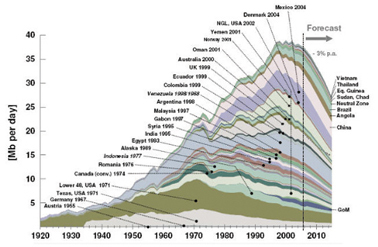 Almost all the oil producing countries already had passed peak of oil production. We have spent the half of oil for over one hundred years, but little did we know that over 80 percent of consumed oil was spent just within recent 40 years. Accordingly, oil reserves we can use will be exhausted under the next 40 years with assuming business as usual; oil demand will be more increased year after year. In addition, most powerful countries are competitively rushing to enlarge their economy, and it will make worse and worse situation by increasing the consumption of oil, inevitably. For instance, Russia is selling huge amount of oil and natural gas in order to develop her economy and national strength recently. Many other powerful countries such as USA, China, Japan, and European countries also struggle to gain oil they need with daring any risks of fight, so called behind-the-scene energy wars. However, this is merely beginning of the energy war, and it will be more and more severe in the future due to insufficient oil supply. Fortunately, the worst was yet to come. However, catastrophic situation is most likely to come sooner than we expected, and it will be unprecedented disaster to the human beings when we do the usual, because, needless to say, energy is essential to sustain current flourishing welfare and industrialized societies. To be specific, it is assumed that global energy demand will be increased 2.3 percent annually for the period 2005-2015, and 1.4 percent annually 2015-2030. No doubt that China and India will take a majorrole to increase of energy demands in the near future with swallowing huge amount of oil. Today, 123 countries are producing oil, and over 83 percent of entire world oil is being supplied by only the top 20 producing countries. Over the 60 percent of oil reserves are contained in the Mideast countries such as Saudi Arabia, Iraq, and Iran. Many specialists strongly insist that yet-to-be discovered reservoir oil be not so much volume owing to already-developed highly-advanced technologies of exploration like satellite, seismic techniques and extraction technologies like Enhanced Oil Recovery (EOR). Not to mention, oil as liquid fuel is one of the most convenient ones to use, store, and transport. For this reason, oil depletion will impact our current lifestyle, especially to the usage of vehicles. On top of that, transportation would be influenced by the lack of oil. Furthermore, food delivery network will be confronted with disorder in many regions not only nationwide but International worldwide. Subsequently, it is not difficult to imagine that there are many undesirable situations such as riots by starved people to get food and water, turmoil of overseas trade by difficulties of delivery, and other chaos to get energy so as to survival. Therefore, some pessimistic experts seriously noticed that a heavy toll of lives will be taken by regional riots, terrors, and wars in not-so-far future owing to the lack of oil on the planet. Not only that, almost all the affairs of society like medical service, schooling, shopping, travel, and business will be faced up to the fatal disorder even up to the disablement of social functions. What Is the Progress of Alternative Energy Development? efficiently than current technological status. Nuclear fission also has many problems like limited resources of uranium and regional environmental concerns. Fuel cell still has many problems to be solved in order to use conveniently with improved efficiencies. Nevertheless, the most hopeful technologies of alternative energy are solar energy and nuclear fusion yet we need more than several decades hereafter. In fact, almost all sorts of energy on earth came from sun except geothermal energy. Basically, the more conversion frequency energy has, the less its own energy remained. Consequently, it is the best way to use directly from the sun light with appropriate instruments like many kinds of solar cells and solar thermal devices. Fortunately, nowadays, many advanced solar cells like flexible thin film photovoltaics and dye-sensitized solar cells are being developed and made significant progresses with higher energy efficiency than other alternative energy sources despite still remaining some technical bottlenecks. Nuclear fusion can produce huge amount of energy, which will be made by the same reaction as the sun’s radiation. However, making extremely high temperature up to reach over the one hundred million degrees Celsius and designing in order to store gigantic energy which will be made by nuclear fusion are the key factors to achieve the completion of these plausible alternative energy technologies. Therefore, it is still too far to solve these fundamental problems. What to Do for Energy Saving? As mentioned at the above, there are still a lot of problems to be solved in order to use alternative energies on behalf of oil. However, we can take easier ways, which can sustain our current lives, than develop alternative energy technology by saving energy in many ways in our living. In fact, unfortunately, most of people who are living in developed countries are addicted to the extravagant spending of energy. In total, 75 percent of the average daily production energy of the world is consumed by the people of the top 20 countries. What to know is that everything we are using in everyday lives is made by spending energy even drinking water, food, clothes, house, and so on, as everyone can imagine. For example, we have better use public transportation than private vehicle. We do not have to waste water and food. We have to keep cooled air in the room in summer and warmed air in winter season. We have better exchange all kinds of used-stuffs with each other in order to be reused by another people than throw into garbage. The maintenance of utility facilities in all the buildings is also significant ways to save losing energy from oozing out of heat. among powerful countries in order to make epoch-making turning point, from time immemorial.